For context, a normal WWE live special, which were previously known as pay-per-views, has traditionally run for about four hours: a one-hour pre-show with a three-hour main show. Even minor events have now stretched close to five hours, but that’s due to a wider WWE roster and the promotion’s decision to make all shows both Raw- and SmackDown Live-branded. But even that is okay on balance. Even if one of those five hours winds up being pretty useless, which is almost always the case, having a hard deadline at least forces WWE to skip on filler matches. 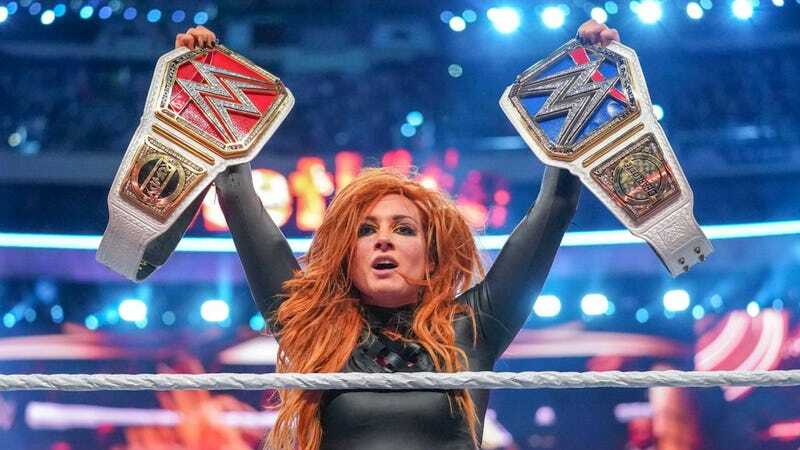 It’s easy, with hindsight but also just a cursory look at the WrestleMania card, to identify several showdowns that could have easily worked on a random episode of Raw or SmackDown Live and lightened the load on Sunday night. Randy Orton and AJ Styles built a great story, but the payoff was a pure wrestling match that didn’t really move the crowd, both because it followed Seth Rollins’ shock win over Brock Lesnar and because the ring lights were blinding the lower level. Samoa Joe and Rey Mysterio had a one-minute match that was shorter than the combined entrance times for both wrestlers; to be fair, Mysterio was nursing an injured ankle, but that’s just more reason to scrap the match. Roman Reigns’ big return to the ring was perfectly fine, and probably worth it for his pyro alone, but the match itself was nothing special. Same with Finn Bálor winning the Intercontinental Championship from Bobby Lashley, although Bálor did have a pretty sweet entrance as his alter ego, the Demon. It was a perfectly booked show, in other words, and as satisfying a “season finale”—that’s WWE’s preferred moniker for its biggest show—as anyone could have hoped for.